Ryan Companies, Cadence Living and an affiliate of private investor Starwood Capital Group have jointly announced a new senior living community in Scottsdale, Arizona. Construction is now underway for the community, Acoya Scottsdale at Troon, which will have 135 independent and assisted living units. Planned amenities for residents include an indoor golf simulator, swimming pool, rooftop patio, multiple different dining venues, fitness center, hair salon, craft room, garden, exam rooms underground parking and valet parking. Ryan A+E, Inc., designed the community’s exterior, while Thoma-Holec Design is working on the interior. If all goes according to plan, construction will wrap up in the middle of 2020. Ryan Companies and Great Lakes Management gathered recently to break ground on Talamore, a new senior living community in Saint Cloud, Minnesota. Ryan is developing, designing and building the project, which is named Talamore at St. Cloud, while Great Lakes Management is set to operate it. The community will have 252 independent living, assisted living and memory care units. Residents will have multiple spaces to drink a cup of coffee and read the paper, have social gatherings, take part in activities or dine. Work for the project is scheduled to wrap up in early 2020. Leaders from Hunt Midwest and Integral Senior Living recently gathered in Royal Palm Beach, Florida, to mark the start of construction for The Capstone at Royal Palm, a forthcoming assisted living and memory care community. As planned, the community will have 84 suites for up to 114 residents and amenities such as a great room, formal dining room, fitness center, bistro, sunroom, access to walking trails and a dog park. Integral Senior Living will operate the community. Rocky Goins and Associates served as the project’s land acquisition consultant, Pi Architects is leading the community’s overall design and Proctor Construction is set to be its general contractor, according to a prior news release. The community is currently slated to open in early 2020. Brightview Senior Living has opened a welcome center at its Brightview Devon community in Devon, Pennsylvania. The community is currently on track to open in April, 2019. As planned, Brightview Devon have 171 apartment homes split among three neighborhoods: independent living, personal care and Wellspring Village. Amenities include a theater, pub, fitness center, beauty salon and barber shop. Corridor Crossing Place, a senior living community in Cedar Rapids, Iowa, has a new name, and soon it will also have a new look. Name change completed, the community is now undergoing a roughly $1.5 million renovation that includes updates to apartments and common areas. Specifically, the work will make room for a new memory care program and also include other enhancements such as a new fire sprinkler system and windows, landscaping projects, furniture updates and a new emergency call system. 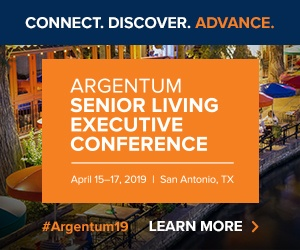 Senior Housing Management took began managing the community — formerly known as Mayvil Senior Living — about three months ago. The doors have opened at Brooklyn Pointe Assisted Living and Memory Care, a new Meridian Senior Living community in Brooklyn, Ohio. The community, which is owned by Steve Nicholas and managed by Meridian, has 80 apartments in a variety of styles such as studio, one-bedroom and two-bedroom layouts. Residents can enjoy amenities such as a grand dining room, fireplace lounge, activity center, library, chapel, theater and a hair salon. Design-wise, the community has materials and elements such as stone and siding, light wells and decorative windows and sunrooms. Developer Housing Trust Group recently celebrated the grand opening of Arbor View, a $27 million affordable senior housing community in Margate, Florida. The 100-apartment community is affordable for older adults earning at or below 60% and 33% of the area median income. Monthly rents range from $428 to $1,002 for one- and two-bedroom units. Arbor View has amenities such as a swimming pool, dog park, computer lab, community room, fitness trail and fitness center. Architectural firm Corwil Architects designed the project, and the construction company was Current Builders. Others on the project team included design collaboration from RPJ, Inc., M.A. Suarez & Associates. HSQ. B Pila was the interior designer for the development. — Local officials are mulling plans for a 69-unit independent living community in Santa Fe, New Mexico. — Plans are moving swiftly ahead for a new 180-unit senior living community in Southbury, Connecticut. — Local officials have given their blessing to a planned 48-unit senior living development in Sioux Falls, South Dakota. — Construction is set to begin next year on a $46 million, 120-unit senior living community in Pendleton, South Carolina. — Erickson Living seeks to build a new sprawling senior living community with between 1,000 and 1,100 units in Fairfax, Virginia. — Abby Development is moving ahead with a 216-unit senior living community in Rogers, Arkansas. — Cadence Living recently won approval for its planned 191-unit assisted living community in Chandler, Arizona. — A development in Greenville, Michigan could include a 60-unit senior community from Clark Retirement. — Work is underway for a 153-unit senior living community from Phoenix Senior Living in Canton, Georgia. — Construction crews are set to break ground this month on a 58-unit senior living community in Gastonia, North Carolina. — Work could begin soon for a planned 220-unit senior living project in Montgomery, Alabama. — A senior living community in Weymouth, Massachusetts, just added 20 independent living and memory care units to its campus.